Crayons were manufactured in Palmerston in the 1950s. 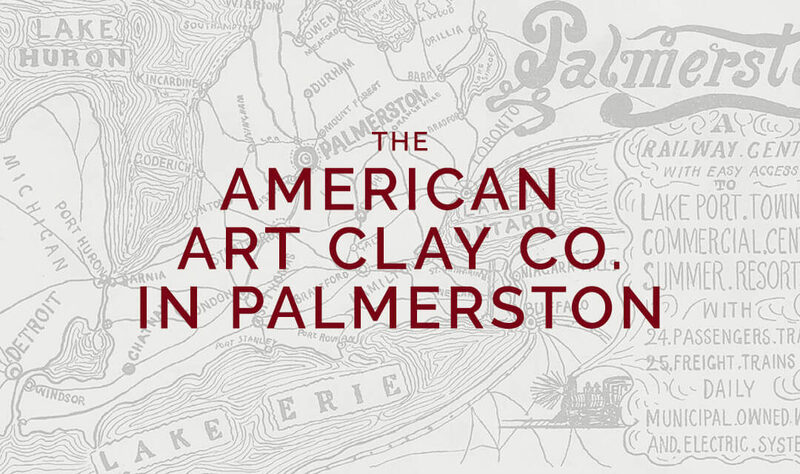 The American Art Clay Co. had its origins in Indianapolis in 1919. The firm specialized in modeling and pottery clay, and later branched into the production of wax crayons and blackboard chalk. In the late 1940’s, taking advantage of the postwar boom in consumer items, the company branched into Canada, setting up a subsidiary known as Canadian Art Laboratories. Operating as the American Art Clay Company of Canada, the firm moved into small quarters on Eastern Avenue in Toronto, in the then-bustling industrial area near the mouth of the Don River. Demand soon stretched the capacity of the building. With nothing else available in the Toronto area, the firm scouted small towns, and liked the look of some space in a building in Palmerston, at the corner of Norman and Main Streets. Superior Motors occupied the front part of the building. Building owner Sam Wald delightedly signed a five-year lease for the rear portion in the fall of 1949. Mayor Woodbridge had constructed the building before World War I to turn out doors and windows. Production shifted to wooden ammo boxes during the war. In the 1920’s, locals knew it as the IXL plant. American Art Clay moved into its satellite plant in the early weeks of 1950. The firm brought some equipment from Toronto. To help set up, they hired Jack Hathaway of Palmerston Machine and Tool Works. A machinist of great ability and imagination, Hathaway rebuilt older machines, modified others and designed new ones of greater speed and efficiency. He continued his association with the plant long after it began production, continuing to improve the equipment. For a small plant, the product line was large. Best known were the wax crayons, packaged in boxes of eight, and larger sizes, up to 32 different colours. Chalk went out in white and 11 other shades. Befitting the company name, modeling clay rounded out the line, packaged in slabs after mixing and colouring. The crayons were made by melting wax and mixing it with the colouring, an exacting task to ensure uniformity from one batch to the next. The molten wax then was poured into a mold, which produced more than 1,000 crayons at a time. The mold then had to be cooled, and the hardened crayons pulled out. They then went to a machine that automatically wrapped a printed paper around each, and glued it into place. From there, the crayons went to the packers, who manually gathered them into boxes of the appropriate size. Another crew packed the boxes into shipping cartons, destined for stores across the country. Blackboard chalk followed a similar procedure, but it was extruded under pressure, rather then molded and then the pieces were cut to length and dried by steam heat. Roy Anderson had the position of plant superintendent, and he also looked after quality control. The basic staff consisted of eight other employees, occupied in the mixing, molding and extruding processes. At peak times, the staff ballooned to 25, the extra workers mainly occupied in the packaging stage, which was not automated. A typical day’s production amounted to about 15,000 crayons. The equipment could produce up to 50,000 pieces of chalk per day when necessary. The firm seemed an ideal addition to Palmerston’s economy, providing work for nine full-time employees and another 15 part-time and seasonal ones. An announcement by the firm in the first week of December 1953 astonished the town. American Art Clay would close its existing plants in Palmerston and on Eastern Avenue, and move everything into new facilities in North York in February 1954. The company offered assistance to any Palmerston employees who wished to move. American Art Clay attempted to find a new tenant: they still had a year to run on their lease of the building. It was a double blow to Palmerston, losing not only a business, but possibly several families as well. Mayor Sam Wald was as upset as anyone. He was the landlord, and had been closely associated with American Art Clay from the time he brought the firm to Palmerston four years earlier. Palmerston had attempted since the 1870’s to diversify its economy away from a dependence on the railway, and had found little success. And in the early weeks of 1954 there were unpleasant rumblings that the railway shops were doomed. Palmerston Council discussed ways of attracting new industry. Mayor Wald noted that Seaforth had recently spent $5000, an immense sum for a small town in the early 1950’s, to hire an agent to find American branch plants. He suggested that Palmerston join together with Harriston and Arthur to follow a similar strategy. Nothing came of that proposal, but the town did begin close consultation with the provincial government in promotional efforts, and the Board of Trade produced a pamphlet. Despite those efforts, neither Palmerston nor other small towns had much success in bucking the general trend of industry to locate and expand in the larger centers.